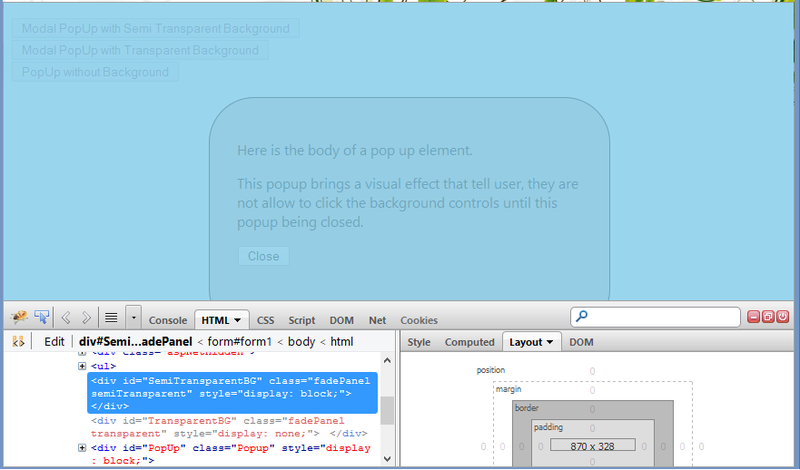 First, let see how a pop up panel look like at html. A div element cover the whole page with semi transparent or solid colour background. Another div element as the container of pop up panel at the centre of page. By understand this, you can easily design your own pop up panel. CSS play a very important role to create the pop up effect at web page. Let me describe some of the important CSS classes that you can find in this sample. To form a full screen background, you have to use 100% for width and height, set 0px to top and left. Position = fixed so that it will not move event the page come with scroll bar. z-index = 9999 so that it will appeared on top of the others. This CSS class applied to the outer of the pop up container. Position = fixed so that it will not move event the page come with scroll bar. Higher z-index so that it will appeared on top of the background panel. margin of left and right are actually adjustable according to the width of the pop up container. For this page, I’m using 25%. This CSS class applied to the pop up container. The important CSS are width and height for the pop up. The rest can be ignored if you don’t want the cosmetic effects. 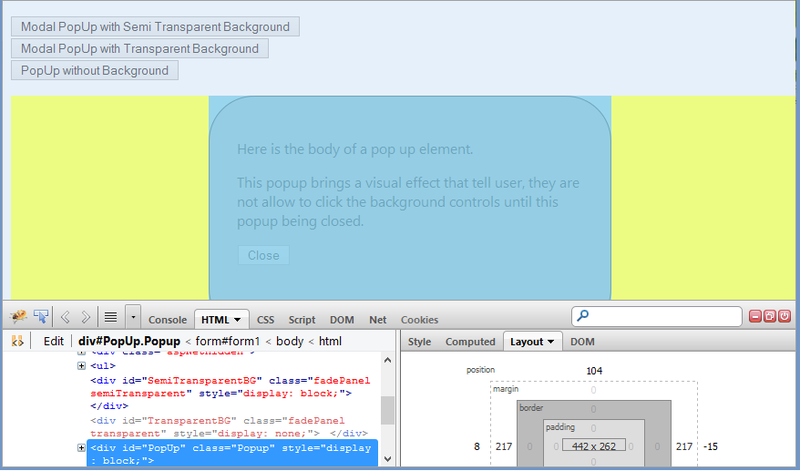 //Hide all pop up related elements during page ready.